My last post was meant to be kind of funny but as I read through it today I realized it sounds like I'm actually complaining that much. I probably really was that day. No, I don't love being pregnant but it's not awful. After experiencing so many changes in my body to make this baby happen it hits me how much of a miracle it really is and how God really knew what he was doing in creating our bodies to be capable of this. It's amazing! Plus, there are some fun things about upcoming motherhood. And right now it's the only thing that's happening thus the only thing to blog about... I'm so sorry world. I've already become the type of blogger I hate that goes on and on about baby and nothing else. I PROMISE I'll talk about something other than that when there is something going on. I can't even explain to you how boring life has been. Hopefully things will look up soon. They're not bad, just boring. Anyway, back to talking about pregnancy and nothing else, here are the exciting things about it. I'm a horrible person and totally forgot how far along I am. I thought I was 19 weeks today but something makes me think I got off a little and might be 20. Either way, I'm about halfway done!! It's gorgeous and was on a blowout sale so she got it for about $200 less than normal. I can't wait to get it and have a place to set it up! Life has been great. And I just remembered something in other news I could write about! I got my diploma in the mail the other day. It's only an associates for now but it's so fun to finally have something to show for my hard work. And I graduated with high honors and it says that across the diploma. Cory was so proud of me, he kept bringing it up. He's the best person in the world. I love that man more than anything. I asked him to surprise me for Valentines Day since it'll be our last one alone. I'll keep you posted on what he came up with. I can't wait to find out! Anyway, there's a more positive update. Sorry about the whining earlier. Oh my goodness, those little baby booties are the cutest I've ever seen! So cute! 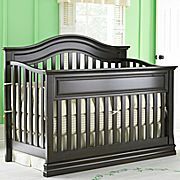 That crib is gorgeous and monkeys are the best!